Researchers at The University of Texas Health Science Center at Houston (UTHealth) School of Dentistry and McGovern Medical School have discovered a previously unknown characteristic of brain-cell aging that could help detect late-onset Alzheimer's disease decades before symptoms begin. The study, "Interleukin33 deficiency causes tau abnormality and neurodegeneration with Alzheimer-like symptoms in aged mice," appeared online in the journal Translational Psychiatry earlier this year. 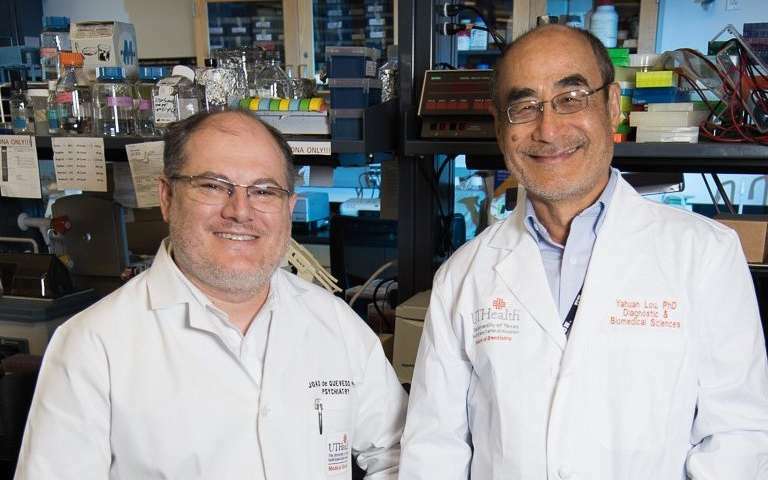 Working with mice, the UTHealth team found that neurons in the brain experienced a sudden increase in aging around the mouse equivalent of age 40 in humans. Normal mice responded with a surge of interleukin33, a protein that activates the body's repair mechanisms to make the neurons healthy again. Mice lacking the IL33 gene didn't experience the surge and continued to decline, eventually developing dementia at an age roughly equivalent to 68 in humans. "We think we're getting old gradually, but when we're talking about these cells, we've discovered that it's not that way," said Yahuan Lou, Ph.D., a professor in the Department of Diagnostic and Biomedical Sciences at the School of Dentistry. Late-onset sporadic Alzheimer's disease occurs after age 65 and represents approximately 95 percent of all cases, with the other 5 percent believed to be genetic. By the time symptoms appear, the brain has already lost massive numbers of neurons. The UTHealth researchers believe the surge at age 40 may be an ideal time to look for biomarkers that predict Alzheimer's long before the damage begins. Lou first detected the power of IL33 while studying premature ovarian failure in mice. "We observed that when we removed IL33, the ovary shrank much faster than normal. So we wondered: If IL33 does this in the ovary, what does it do in the brain? The brain has an abundance of IL33." Looking for collaborators who could test that question, Lou was surprised to learn that researchers from McGovern Medical School's Department of Psychiatry and Behavioral Sciences had recently moved into the new UT Behavioral and Biomedical Sciences Building that he and other dental school researchers had also newly occupied. Among his new neighbors were Department of Psychiatry Professor Joao De Quevedo, M.D., Ph.D., and Assistant Professor Ines Moreno-Gonzalez, Ph.D., of the Mitchell Center for Alzheimer's Disease, who had the expertise and resources for analyzing rodent behavior and correlating it to humans. A collaborative team soon formed, and their mouse study led to the paper in Translational Psychiatry with plans for follow-up studies to explore the tantalizing results. Lou said a group of researchers in Singapore recently conducted an experiment using mice that model familial early-onset Alzheimer's disease. "When they injected IL33 into the [Alzheimer's] mice, they saw that the plaque load was reduced, but they didn't know why," he said. "We've figured out why." The IL33 injections seemed to relieve symptoms temporarily, he added, but did not cure the disease. The effects lasted about two weeks in mice—equal to several months in humans. Lou believes finding a way to enhance the brain's own supply of IL33 may lead to potential treatments for the disease. The cause of late-onset Alzheimer's is a medical mystery with many potential causes under investigation, including neuro-inflammation, abnormal aging, smoking, and infections. IL33 deficiency is another promising lead, with additional studies planned as funding is secured.